Knowing how to write and format headlines and subheadings is an important skill for all CopyPress creatives. Both writers and editors are tested on their ability to format headings during the onboarding process. Headlines and subheadings are important parts of blog content because they highlight main elements of the topic, add to the scannability of the article, and lead the reader through the content. Generally, there should be at least three subheadings within a 500-word blog article. Don’t ever force keywords into headlines and subheadings when it doesn’t make sense or sound natural. You should still use the keyword in the body of the content. Subheadings should always be formatted using the appropriate paragraph formatting inside the CMS. 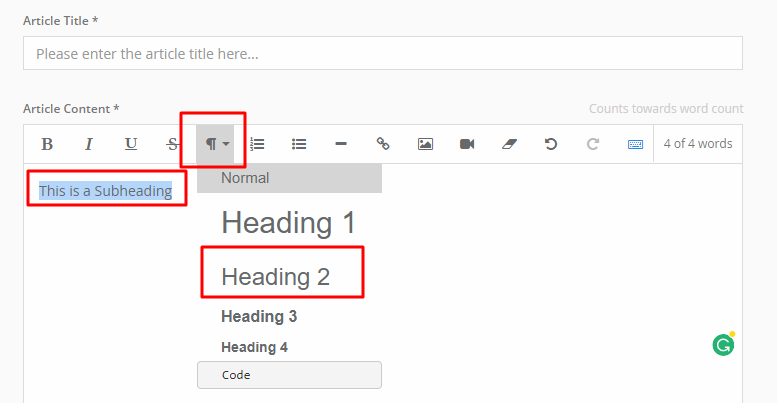 Unless otherwise specified in the Style Guide, subheadings should be formatted using the Heading 2 tag within the Paragraph Formatting icon in the Article Writing Window. All subheadings should be formatted with title tag hierarchy. That means, when you use a subheading within a subheading, it should be formatted with a smaller heading format. This is an example of heading hierarchy for a post that begins with a subheading formatted as Heading 2.